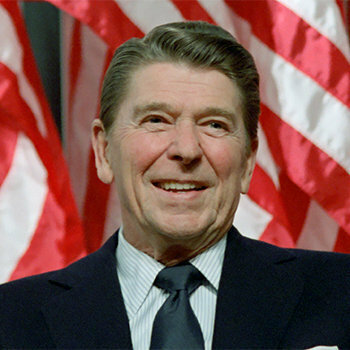 He is the 40th president of the United States whose controversial economics philosophy, Reaganomics, impacted the latter part of the 20th century. He was born in Tampico, Illinois. As a boy, Reagan's father nicknamed his son "Dutch," due to his "fat little Dutchman"-like appearance, and his "Dutchboy" haircut. He was a film star during the Golden Age of Hollywood and appeared in movies such as 1939's Dark Victory, 1940's Knute Rockne, All American, and 1942's Kings Row. He and his first wife, Jane Wyman, divorced in 1948. He married Nancy Davis in 1952, fathered four biological children, and adopted a son named Michael. Reagan received a number of awards in his pre- and post-presidential years. He received a lifetime gold membership in the Screen Actors Guild, was inducted into the National Speakers Association Speaker Hall of Fame and received the United States Military Academy's Sylvanus Thayer Award. Reagan died of pneumonia, complicated by Alzheimer's disease, at his home in Bel Air, California, on the afternoon of June 5, 2004. Eddie Bravo is a Jiu-Jitsu instructor and former UFC analyst. He is the owner of 10th Planet Jiu-Jitsu and the Eddie Bravo Invitational. Winner of the third series of Britain's Got Talent, Ashley Banjo is an actor and a street dancer. He is best known as the leader of dance troupe Diversity,. Maya Le Clark is an American actress, well-known for playing Chloe Thunderman on the Nickelodeon series, The Thundermans. She also appeared on Nickelodeon's Ho Ho Holiday Special in 2015.